If you’re one of the approximately 99% of adults over 40 years old who have had chickenpox, the virus that causes shingles is already inside your body. It can reactivate at any time, and your risk increases as your immune system naturally declines with age or disease. Shingles, also called Herpes Zoster, is a painful skin rash that often appears on one side of the face or body and typically lasts from 2 to 4 weeks. Other symptoms can include fever, headache, chills and upset stomach. According to the CDC, the infection strikes about 1 million people in the U.S. each year and nearly one in three adults will experience a bout of shingles in their lifetime. Shingles typically produces a painful rash that blisters and scabs over in 7 to 10 days, it usually clears up within 2 to 4 weeks. Over 93% of people who get shingles experience acute pain, and many describe the pain as aching, burning, stabbing, or shock-like. Most commonly, the shingles rash develops as a set of blisters that wraps around either the left or right side of your torso. Sometimes the shingles rash occurs around one eye or on one side of the neck or face. You're 60 or older because age significantly increases your risk of complications. SHINGRIX is a 2-dose vaccine series (0.5 mL each) administered as an injection into the muscle in the upper arm. It is important to complete the 2-dose series to help prevent shingles. SHINGRIX works to boost your body’s protection against shingles. Your immune system declines as you age, and that puts you at an increased risk for shingles. For those who are 50 years and older, SHINGRIX, helps your immune system defend against shingles regardless of age. SHINGRIX is given as a 2-dose series, with the second shot administered 2 to 6 months after the first shot. To ensure you get the protection against shingles offered by SHINGRIX, it's important to get both shots. HOW IS SHINGRIX® DIFFERENT FROM ZOSTAVAX®? Both vaccines are approved for preventing shingles in patients who have previously been infected with chicken pox. Zostavax® is a live vaccine (a weakened form of the virus given to help your immune system fight off the real virus) given directly underneath the skin, generally in the back of the arm, as a one-time dose. It is currently recommended for all patients 60 years of age and older. Shingrix® is an inactive vaccine (a virus made in the lab that is similar to the real virus that helps your immune system) and requires 2 doses (given 2 to 6 months apart). The doses are generally given directly into the muscle in the arm, like the flu shot. Both vaccinations can cause similar side effects such as pain/redness in the area the vaccine was given, muscle pain, fatigue, and headaches. These side effects are often mild and only last for a few days following the vaccine. Before Shingrix®, Zostavax® was the only vaccination available for the prevention of shingles. In clinical trials, Zostavax® vaccinations prevented a shingles outbreak in only 51.3% of patients who were aged 60 years of age and older. In patients between the ages of 50 to 59 years of age, Zostavax® prevented shingles 69.8% of patients; however, it prevented shingles in only 37.6% of patients above the age of 70 years old. On the other hand, in clinical trials, Shingrix® prevented shingles outbreaks in 97% of patients 50 years of age and older, and in 89.8% of the patients who were above the age of 70. 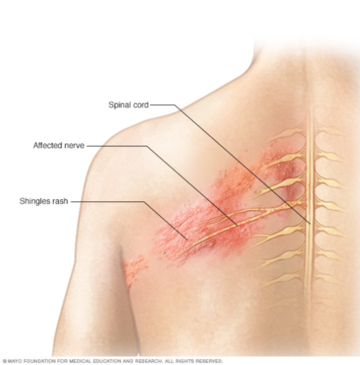 What is Shingles, and how can Shingrix help protect against it? Shingles is an itchy and painful skin rash caused by reactivation of the varicella-zoster virus (the same virus that causes chickenpox). SHINGRIX uses your body’s own immune cells to boost your immune system’s defenses against shingles. It is the only shingles vaccine proven to be up to 90% effective in clinical trials. I feel healthy; am I really at risk for shingles? 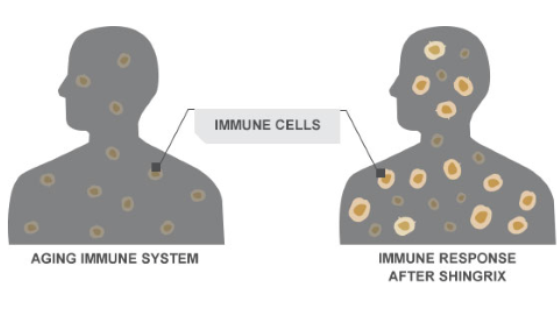 If you’re one of the 99% of adults over 50 years old who have had chickenpox, the virus that causes shingles is inside your body and can reactivate at any time. 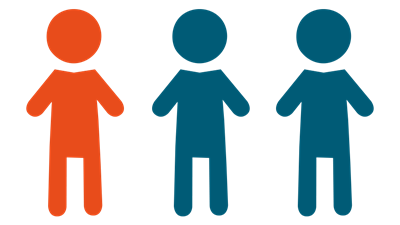 1 in every 3 people in the US will get shingles in their lifetime. No matter how healthy you feel, your immune system declines as you age, and that puts you at an increased risk for shingles. Does my risk of shingles increase as I get older? Yes, your risk of shingles increases as you get older. 1 out of 3 people in the US will get shingles. Shingles are not contagious, but the virus can be spread from a person with active shingles to someone who has never had chickenpox – or was never protected against it. In this case, the person exposed to the virus might develop chickenpox. The virus spreads through direct contact with fluid from the blisters. Once the shingles blisters have developed crusts, they’re no longer contagious. Is SHINGRIX covered by my insurance? Most insurance plans cover SHINGRIX. Check with your doctor or pharmacist about vaccination. SHINGRIX is the only shingles vaccine proven to be up to 90% effective in adults 50 years and older in clinical trials. How many shots of SHINGRIX do I need to receive, and when? SHINGRIX is given as a 2-dose series, with the second shot administered 2 to 6 months after the first shot. It’s important to receive both shots of SHINGRIX. If you’ve already had your first dose, sign up for voice, email, and text reminders for your second dose. How will I feel after each shot? Pain, redness, and swelling at the injection site, muscle pain, tiredness, headache, shivering, fever, and upset stomach are all common side effects of SHINGRIX. Talk to your doctor about ways to manage injection‐site pain. Can I receive SHINGRIX while pregnant or nursing? SHINGRIX was not studied in pregnant or nursing women. Tell your healthcare provider if you are pregnant, plan to become pregnant, or are breastfeeding. You should not get SHINGRIX if you are allergic to any of its ingredients or have had an allergic reaction to a previous dose of SHINGRIX. SHINGRIX may not protect all individuals. Ask your healthcare provider about the risks and benefits of SHINGRIX. Only a healthcare provider can decide if SHINGRIX is right for you. To learn more about SHINGRIX, talk to your pharmacist.